The Treo 755p will be a PalmOS-based Treo available in just over a week on the Sprint network. It sports the same antenna-less form factor, indeed the exact same form factor, as the Treo 750. 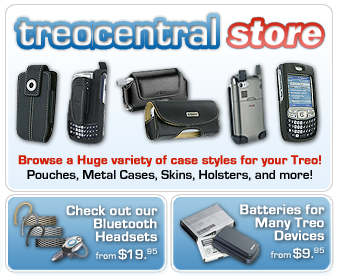 Coming in both "Midnight Blue" and "Burgundy," it is identical in nearly every way to its predecessor, the Treo 700p. EVDO Rev 0 (not Rev A) data speeds. ...Also the same: a disappointing lack of WiFi. Software, on the other hand, has seen some improvements on the 755p. The 755p includes some new applications in the ROM, including Google Maps, which can now be searched directly from the Contacts app. Also included is a Yahoo, AIM, and MSN-compatible IM client made by Thumbscreen (recently purchased by OZ Communications, which makes IM applications for many different mobile devices). The 755p also has simplified Dial-up Networking (which, however, will require a "phone as modem" plan from Sprint) as well as full compatibility with Microsoft's push email, based on Exchange server. Out-of-the-box Push Email has long been missing from the Treo, and though the Treo likely has more push email options available to it than any other smartphone (including Good, Microsoft's Exchange, and Blackberry Connect), it's good to see at least one solution built-in. Most notably for TreoCentral community members, the bugfixes and other improvements that are due later this month for the 700p have already been applied to the 755p and early testing indicates none of the significant issues reported on our forums. Not included in the ROM is the well-received phone application found on the Treo 680. Instead the phone interface on the 755p is identical to the one found on the Treo 700p. Asked for comment, Palm noted that the 755p is more of a power-user / business phone compared to the 680. The 755p is expected to be available in "mid-May" for 279.99 with a contract. This price is $20 less than the current price of the Treo 700p, which is welcome and likely a part of Palm's new strategy of trimming the cost of their devices in favor of maximizing market share. TreoCentral's Jennifer Chappell will have a full review available shortly. Stay tuned to TreoCentral for more information about the 755p, including video and an interview with 755p Product Manager Rob Katcher on Monday's TreoCast. In the meantime, discuss the new 755p in our forum!